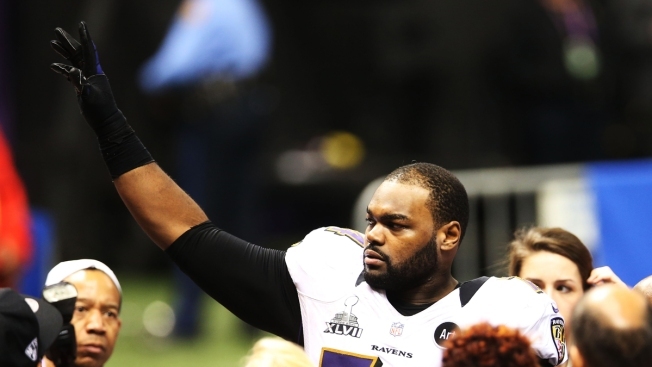 In this Feb. 3, 2013, file photo, Michael Oher, then #74 of the Baltimore Ravens, celebrates after winning against the San Francisco 49ers during Super Bowl XLVII in New Orleans, Louisiana. Oher, the subject of the film "The Blind Side," was released by the Carolina Panthers after failing a physical. The Panthers released the former starting left tackle — the subject of the movie "The Blind Side" — after he failed a physical on Thursday. The move comes six days before the Panthers are scheduled to report to training camp and 10 months since Oher last played. Oher appeared upset over Carolina's decision to fire general manager Dave Gettleman earlier this week. The Panthers signed free agent tackle Matt Kalil to take Oher's spot at left tackle earlier this offseason. They also drafted offensive tackle Taylor Moton from Western Michigan in the second round.